Leave it to the amazing Arun Rajagopal in Oman to come up with the most amazing opportunities to highlight The Age of Conversation. This time he came up with: It’s MINDBLOGGING today! o What are the advantages of blogging? Mind Blogging’ will expose readers in Middle East not only to ‘The Age of Conversation’ but also to the world of social media and conversational marketing. 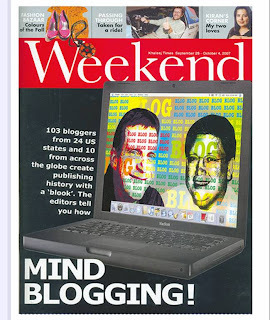 This 9/28/07 Khaleej Times "Mind blogging" article by Pratibha Umashankar is available online via this link. Or, you can download a pdf from Arun via this link [more photos in this version!]. The article is great fun and adds additional perspective on The Age of Conversation. 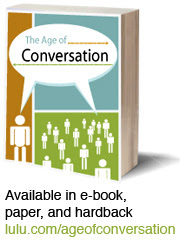 Also, if you haven't already, consider reading The Age of Conversation Roundup for a taste of the topics [or slices] covered within the book. [BTW, Arun went to great efforts to gather photos for this piece. Despite physical distance and time zone differences, he tracked us and our photos down. There I am -- middle top row, yellow shirt -- posing for my self portrait with Age of Conversation. Many fellow authors posted similar shots on flickr.com. What an amazing age we live in that creates this kind of mindblogging connection and conversation across the globe thanks to a virtual cooperative work of love! I'm in awe. How might you create such mindblogging wonder? How might you connect those in your community - employees, suppliers, long-time customers, future customers - as tightly and warmly? Think of the sense of connection you might feel toward an alma mater, a town, a church, a fraternity or sorority, a culture, a family. Doesn't that transcend time? Well the community from The Age of Conversation not only transcends time, it also transcends place. I wish this sense of community upon everyone I know. That is how mindblogging it is! N.B. : if any of you are train aficionados [as I am], do check out Arun's amazing photos and video clips of Indian Railways. The official notices regarding Surfaces 2008, the yearly mega-trade show for the flooring and carpet industry, have started arriving. Have you gotten yours? The show takes place as usual in Las Vegas from Wednesday, January 30th, 2008 through Friday, February 1, 2008 at the Sands Convention Center. This year, the Surfaces Educational Programs sports a new logo with the tagline – Learn, Network, Succeed - to capture the goals of the education program and the overall SURFACES event, according to Carol Wilkins, conference manager, who pours her heart and soul into this event. Last year, I presented Why Amazing Shopping Experiences Matter. This year, I am scheduled to discuss "What Your Register Tape Doesn't Tell You." Are you intrigued? Here's an early hint.... It will definitely address the retail experience, with some Paco Underhill thrown in. 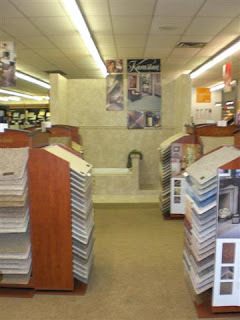 By the way, if you have some strong shopping experience examples to recommend -- flooring related or not -- do let me know. Thanks! Here is the seminar schedule at a glance. I'm just skimming the surface [no pun intended], but there you have it! Register for Surfaces 2008 for yourselves for intense learning opportunities. Disclaimer: I am a member of the Surfaces Education Committee. The notion of "Conversational Marketing" makes tremendous sense given The Age of Conversation. It makes even more sense after reading Beyond Buzz: The Next Generation of Word-of-Mouth Marketing by Lois Kelly, a wonderful guide to converting traditional one-way marketing into a two-way conversation that invites and welcomes customers into a relationship with you. It's a concept that comes out of The ClueTrain Manifesto since markets are now conversations. I was particularly interested in reading Lois' book when Nettie Hartsock, Hartsock Communications contacted me [yes, she sent me a complimentary review copy] and I realized that I knew this author! I had heard Lois speak on a panel at the Columbia Business School/Corante Innovative Marketing conference Marketers' Forum in June 2006. Going back to Beyond Buzz - it's practical and filled with valuable guidelines on how to make the elements of buzz and word-of-mouth marketing more relevant to the kind of relationship building that consumers demand of us. Definitely worth reading, highlighting and referring to frequently. I was struck by how many of the elements Lois describes are ones that marketing-to-women experts emphasize. The one-way, hard sell, traditional push approach is a losing proposition. Much better to listen, build relationships, and actively engage consumers in a conversation through which we both learn from one another. It's about building rapport [vs. report-like talk]. It's about establishing trust, and being authentic. It's about getting as far away as possible from transactional communications where consumers remain detached and disengaged. 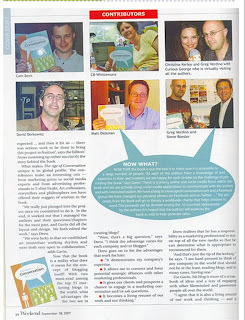 From the press kit: "The first book to focus on the message - not just the mechanics - of conversational marketing. [It] provides practical advice, tools, and techniques for listening in new ways, creating fresh ideas to talk about and re-designing marketing roles and functions." Great marketing is now about meaningful communication. It engages marketers and brands with end users in interesting discussion using both new and traditional channels to build understanding, trust and excitement that keeps customers talking about what you're selling. Consumers are now in control, so it's time to be interested in their world and how to add value or meaning to their lives, rather than focused solely on our organizations and perspectives. In so doing, we can build trust with them and become more relevant. People talk to and believe those they trust. If they are interested in what a friend tells them, they'll ask to hear more. Unfortunately, traditional marketing and communication tools don't naturally encourage people to talk. Advertising and direct marketing promote; websites and public relations inform. Neither really engages consumers. With Web 2.0 technology, we can now engage in conversation with large numbers of people, regardless of geography or time constraints. The challenge is that we must have something interesting to talk about, relevant to a consumer's life, meaningful to him or her, and that helps make sense out of the dizzying array of options and conflicting information available. Too many choices and too much information can paralyze. This sense making or 'making meaning' that Lois describes is a function of relevance, context, pattern making, and emotion. The goal is to get people's attention, then make sure we make sense [i.e, they understand what the value is to them], so they can process our information, and ultimately remember it. 3. Finally, identify someone to be responsible and accountable for it. Making meaning helps overwhelmed consumers make sense out of too much information; if we've listened carefully enough, we are able to frame the information in a way that is relevant to the audience. We enable consumers then to make decisions; we help them understand the benefits to them; we increase the relevance of making the decision. This I found intriguing: marketers help people see patterns or relationships between ideas. People can then connect the idea with the context, allowing them to see value. If they don't see the value, then the idea is meaningless or irrelevant to them. But, if the idea relates to a pattern, then it is more likely to connect to emotions and feelings we have around that pattern. Emotions strongly influence whether a person will believe or take action. Including negative emotions linked with insincerity, indifference or lack of interest. Remember that we are trying to establish trust and be authentic to engage in conversational marketing. Which means that we must give people reasons to believe in us. Kelly describes 10 characteristics of an effective point of view. These 4 are essential: being engaging, true, relevant and genuine. The rest strengthen the point of view: being fresh, connecting the dots, being memorable, talkable, leggy [through multiple channels], and likeable. If you feel uneasy about engaging in conversational marketing, consider that the goal is to communicate to customers that we are truly listening to them [which echoes the thoughts in Book Review: How To Talk To Customers]. It's comparable to the common courtesy shown toward individuals we respect: we recognize their existence; we actively listen to and acknowledge them; and then by accepting their perspective as valid, we endorse them. Mind you, endorsement does not automatically indicate that a company agrees with a customer's perspective or that it must take the requested action. Rather, it expresses recognition and respect for the individual, and acknowledges the legitimacy of the perspective. To build loyalty, though, we must explain why we don't take the action recommended. Language and style play an important role in building loyalty and making meaning for customers. Jargon must be banished. Out with the buzzwords! Instead, communicate in a conversational style [this is conversational marketing after all!] using human language. Make it relevant, be authentic and sincere. Why? Because consumers pay attention to companies that express an interest in them and what they want to know or understand. They remain loyal when they feel emotionally connected to a company. Making it critical to think from the consumer's perspective rather than that traditional internally-focused, product centric company perspective. Making it critical to ask questions to better understand why a customer isn't interested. This is marketing as the voice of customer service. Marketing as teaching, where the more empowered employees are, the better the opportunity to delight customers and engage them in an ongoing conversation. Conversational marketing makes marketing be about making our products and organization meaningful to potential customers. It requires that they feel appreciated and listened to, and that we feel comfortable discussing ideas, issues and points-of-view with them. Only then will they get involved, make purchases, become advocates and tell everyone they know about their wonderful experience! That goes way beyond Buzz! Do also listen to BuzzMarketingForTech's Podcast with Lois Kelly, which also features a link to this article by Lois Kelly and David Maister outlining several of the premises that Beyond Buzz develops. It truly was the Night of the Iguana. Well, not that Night of the Iguana - although I've been to that one's location in Puerto Vallarta. Nonetheless, there absolutely was an iguana, as you can see from the picture. This Night of the Iguana took place in NYC, and - in true blogger meet up fashion - was outstanding! Naturally, CK got it going. First, Curious George - The Age of Conversation mascot - made it. Here he is in Kofi Annan's hands surrounded by Carolyn Townes - the Wild W Wiki Woman, CK, David Reich and Steve Woodruff, the "father of George" [as Toby Bloomberg describes him]. If you remember, I first met Steve for the Curious George hand off back in mid August. Here it is September and George hasn't yet left the Northern New Jersey/ Manhattan area. In fact, even though he made to it the NJ outskirts of Philadelphia, he hasn't yet made it into Philadelphia, let alone Pennsylvania. Nonetheless, he's having a good time, and -- I'm happy to report -- still holding on dearly to his own copy of The Age of Conversation! What made the evening so spectacular resulted from connection, conversation and community. Conversation: No wonder MarketingProfs is so wonderful! Ann Handley is a delight. By the way, anyone dismissive of virtual worlds: beware! You should definitely reconsider. As I am rapidly realizing, thanks to Webkinz, our children are intuitively absorbing what to us may be science fiction or simply a Hollywood reincarnation of the Star Trek Holodeck. Virtual worlds are here to stay and will only become more real and more relevant to our lives. For example, did you know that Second Life is successfully being used in university curricula? [see Educators explore 'Second Life' online and Second Life University], for corporate training, for press briefings and even to parallel Congress opening its 110th session in Second Life. Community: I love talking with Toby as she is warm, intense and fascinating. She has wonderful observations and ideas relating to community building and social media with a strong practical bent that I appreciate tremendously. A conversation with her always has me re-examining assumptions and pre-conceived notions. What Toby also does so beautifully is graciously welcome additions to the community. If it hadn't been for her, I never would have met Carolyn, the Wild W Wiki Woman, who may join the Bathroom Blogfest '07! Stayed tuned for more on that. She also invited Dana VanDen Heuvel and Bill Flitter, co-conspirators in the AMA Hot Topic workshop that Toby was involved in. I didn't get to spend much time with them, but intend to learn more about them through their blogs so I'm ready for the next meet up. Of course, the other woman who creates and builds community endlessly is CK, pictured here with me. She included the anonymous blogger Tangerine Toad [Blog name: ToadStool]. I didn't get to talk much with him either, but am intrigued with his anonymity and point-of-view! Here, you have a handful of Wild W Wiki women present: C.B., Toby, C.K., Carolyn and Ann. In thinking over this memorable Night at the Iguana, and the role that connection, conversation, and community played, I urge you to consider the following. Create community with your customers, your employees, your suppliers. Develop it, nurture it, invite new members to join. You'll be amazed at the strength and vibrancy of it. Your community will lead to connection. It will also lead to valuable conversation. And, before dismissing all of this as blogger nonsense, consider that we are all consumers - and we talk [or blog]. Those of us who aren't blogging, are still talking, and also reading - especially what others are writing about everything. Have you purchased your copy yet? The book captures real wisdom. Afterall, The Age Of Conversation represents a one-of-a-kind worldwide collaboration between marketing professionals all passionate about the topic of The Age of Conversation. I kid you not! Over 100 bloggers from 24 states and 10 nations [103 to be exact]. Each contributing a chapter. Each offering perspective and insight on a phenomenon that - whether involved in the blogosphere or not - affects us increasingly: how citizen marketers are changing the landscape. Each taking a different tack to describe what The Age of Conversation means - including the cover design - created by David Armano! Not only will you get a taste for this phenomenon of web 2.0, but you also get to sample 103 unique blogger voices as each one carries the passion and perspective that resonates in each one's blog. Read the chapters and you'll have a better affinity for the individual author. You'll find that you want to spend more time enjoying that blog voice. All because of The Age of Conversation. Here's the most exciting news.... We've already generated more than $10,000 in profits to benefit Variety. That rocks! It only seems fitting to end The Age of Conversation 'slices' with one on change. After all, a book that explores the magic of conversation in this new age of social media naturally addresses change. Change is afoot as these authors explain. David Armano in "The Relationship Renaissance" celebrates the "resurgence of connectedness" resulting in "virtual relationships... very real, often times starting digitally and continuing in the physical space." The reason? "... The way we live is gradually changing... The power has shifted from the few to the many." Ryan Barrett asks in "Face-to-Avatar" "Is face-to-face contact being neglected?" It's a good question. For many of us, Web 2.0 means increased opportunity for connectedness, for reaching out and expanding relationships. For others, it may instead represent an environment more real than reality itself. Emily Clasper offers a new perspective on Library and Information Science in "Communicating Our Way to User-Centered Library Service." Libraries have changed from "providing access to information to a new focus on providing user-centered services." Library customers are evolving from "consumers of pre-determined content into empowered collaborators who want to be active participants in creating the services they enjoy." Information itself, once scarce is now plentiful! Matt Dickman brings historical perspective to the Age of Conversation in"Technology is the Thread That Binds Conversation." In the first century, book binding helped to spread ideas. And, then, the printing press in the mid-15th century spread ideas faster and more broadly. Today, the internet through tools like blogging technology has "democratize[d] publishing and decentralize[d] authority." Furthermore, "the collective voice we form is re-defining publishing." How exciting! Gavin Heaton develops "The Promiscuous Idea." He says, "we are all becoming the connected storytellers of this new era... We are [also] dealing with a different type of story... We can link into the middle of a raging debate or witness the genesis of an idea that can change the world, and the narrative that we are dealing with is no longer linear but multi-textual, layered, overlapping and promiscuous.... promiscuously reinventing [itself] word by word." Tim Jackson asks "Are You In The Conversation?" It's serious stuff. "Here's the core, the kernel, the meat of the matter; you can bet your company's entire marketing budget, that if you are not online in some form or another, where your customers ... are spending more and more of their time, somebody else is and they are taking them away from you..."
Dustin Jacobsen describes "Engaging Consumers in the Mobile Information Age." Did you know that "there are three times more mobile phones than personal computers, with the line continually blurring between a mobile phone and mobile computer[?].... [so] what is the best way to engage the audience?" Talk about requiring a non-traditional approach! In "The Voice of the CEO," David Koopmans asks whether The Age of Conversation will "change the way our CEOs communicate?... This is not just about blogging; it is about a new mindset for people in positions of power that is more direct, less controlled and interactive." Jim Kukral describes the "new online conversation ... where attention wins" in "Can I Have Your Attention Please?" It's a world where "this new type of user generated content goes beyond words on a page in a browser.... It's fresh, it's new, it's ... engaging. And... It gets attention." Karl Long describes "Viral Games - Alternate Reality Games" uncovering a world that many may not be aware of, but that in fact is very much 'happening'! An Alternate Reality Game [or ARG] exists around Lost, for example. Anyone interested can explore alternate realities -- as in WorldWithoutOil. It's "an interesting ARG because only the prelude has been scripted. The rest of the story of what a world without oil will look like will be developed by the participants of the game." Imagine the learning that takes place. Imagine the possibilities for unexpected and stimulating conversation! Paul McEnany illustrates in "Television in the Age of Conversation" the evolution of our interaction with the medium. From 3 channels in 1975, we're up to 400 - most of them irrelevant. "Before, TV was about high-paid executives, Hollywood mega-stars and prime-time budgets. Tomorrow, it's all about me and my friends." Andy Nulman delights us with "How to Shout" asking us to "consider conversation to be shades of black, white and grey; shouting is the color.... Like singing, great SHOUTS come from the gut, not the throat. They are emotional, not rational, inspired, not contrived. Shouting is ... about making yourself interesting." Ryan Rasmussen states "It Is Not Enough to Simply Listen." He explains that "the most important thing to remember is that [engaging this pool of creative talent] should be done soon. [And] an approach to understanding the customer's perspective by immersing oneself within said community, using the same tools for communication and collaboration, results in nothing less than a new form of business intelligence." In "Want to Change the Organization? Change the Conversation," Steve Roesler [to whom I sent Curious George - our Age of Conversation mascot] suggests that "the successful New Leader will realize that organizations are now inhabited by people who are either part of the conversation or disengaged. Internal social media will become the friend of the New Leader or the enemy of change." And that means that the conversation in the workplace must be meaningful to those who work there, in order to engage them fully. Gary Schoeniger says in "The New Entrepreneurial Paradigm" that "a new breed of entrepreneur is emerging, adapting to a new global economy where the old rules no longer apply, where no one is in charge and no one is coming to the rescue.... To [whom] problems are opportunities", who thinks more like an "insurgent rather than an employee." Ron Shevlin describes "Behavioral Conversations" rather than simply verbal ones. Behavioral in that consumers interact with our sites, and based on their behavior communicate information back to us. "These are just the one-to-one conversations that a single customer has with a firm. But customers care what other customers are doing [and not just saying]. Marketers must relate these one-to-one behavioral conversations to the larger community..... [and] develop a new marketing competency..."
Jamey Shiels compares today's online conversation to high school dances of not so long ago in "The Wallflower." Our opportunity is to not be a wallflower and instead to engage. "The world today is connected, engaged and interacting. Social media and new marketing are allowing individuals, corporations and brands to interact like never before.... [But] almost 85% of Internet users are either inactive or spectators in the social media space.... That presents an incredible opportunity for us to reach out to the 85% and build an audience, build brand awareness and brand loyalty.... It's time to dance." In the realm of relationships, Kimberly Dawn Wells in "Untitled" details new approaches to breakups. Luckily, "while 11% of adults surveyed thought it was acceptable to break up via email, DIY IM divorces are still a thing of fantasy." Nick Wright starts out "Creating Video Conversation" saying that "marketing is becoming less about finding a way to sell and more about communicating with your consumers." Although still a niche venue, "video is a language consumers can understand an displays an openness they will appreciate. The nature of constant consumer feedback keeps this conversation authentic. Motivate your consumers to use video to talk with you and you'll have your own media group working for you in no time." It's always fun to come full circle especially when it comes to Flooring It Differently. Dobson Floors, Garland, TX appeared in the article that triggered my very first post: Women Of Flooring America Making Their Mark. 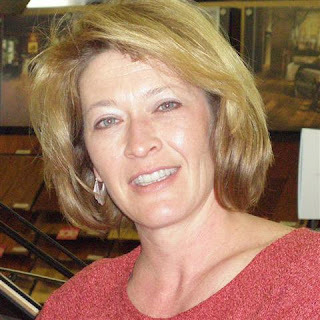 Dobson's president, Suzanne Brown, is one of a few women in the flooring industry working day in/out to floor it differently and improve the flooring shopping experience for consumers who shop there. Women in particular appreciate these differences! Sonya Keller, our Wear-Dated representative in that part of Texas outside Dallas, interviewed Suzanne Brown on September 4, 2007. SK: Suzanne, what inspired you to get into the carpet business? It was by chance, actually. Dobson Floors was my first employer out of college. I was hired as a receptionist at one of our satellite stores. Within my first year at the company, I became an “in-house” decorator working with custom home builder customers. Over the past twenty-two years, I have held various sales positions, moved into management and eventually became president of the company. I love the industry. I learn something new everyday. If you find a good company to call “home”, you can achieve really great things through integrity and hard work. SK: What made you take the retail approach you've taken? To be honest, I’m fine tuning my retail approach constantly. Two things that we try to remain consistent on are providing premium quality products and outstanding customer service. We try to always reflect this in both our product merchandising and marketing/advertising pieces. Although we offer some exceptional values, our brand message is not to be a “discount house”. SK: How do consumers, especially women consumers, react to your store experience? The most consistent feedback that I get from consumers is that they are amazed at the product selection that we offer and that our salespeople are incredibly knowledgeable about these products. We have product training sessions almost every week. We have a really great group of people that strive to be “flooring consultants” as opposed to simply “salespeople”. Consumers really seem to appreciate that difference. SK: How do you keep up with trends? We are fortunate to be a member of Flooring America. They invest incredible amounts of resources on tracking flooring trends globally, nationally, as well as regionally, and they share this information with their membership. On a personal level, I am involved in different types of affiliations and networking groups that allow me the opportunity to share information with other floor covering professionals and members of the A&D community. I also try to read a lot of design magazines [two favorites are Metropolitan Home and Architectural Digest] and attend trade shows whenever possible. SK: How do you showcase trends to consumers? We update product samples constantly so they reflect current trends and offer our customers as wide a range of choices as possible. 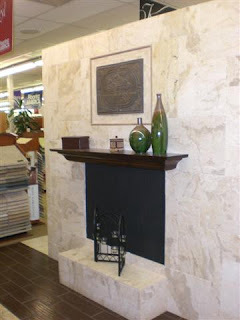 Products that we choose to keep in stock inventory are displayed prominently in the store. In addition to product samples, I make sure that our display floors are kept as up to date as possible, changing approximately once a year. I also regularly create grouted mini-boards with different tile/listello combinations that act as "idea starters" for customers. SK: What other special steps do you take to be different in your community? We have been fortunate to have been selected as the Outstanding Floorcovering Supplier by the Consumers Choice Award since its inception in the Dallas/Fort Worth area. This has been a great honor for us since it is voted on by members of our local community. Additionally, we have contributed to Habitat for Humanity and the “Go Red for Women” Campaign from the American Heart Association. I asked Sonya to describe the store as a consumer would see it, and help put the pictures above into perspective. When you walk into the store, it is divided into two areas. To the left is hard surface and to the right is soft surface, with Karastan immediately visible. The showroom is very open and draws one inside the store to see more. The displays on the soft surface side [see photo right] are low enough that the whole showroom is visible. That's very shopper-friendly! 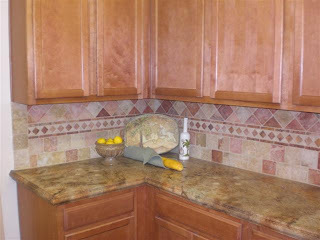 The tiled kitchen vignette with marble counter top pictured above shows the view immediately to your left as you enter the hard surface side of the store. It acts as a visual "entrance" into the tile area. Notice from the photos how the store doesn't follow a rigid format. Displays and vignettes break up the space, creating interesting inspirational spaces that engage the shopper. Congratulations, Dobson Floors for truly Flooring It Differently! Thank you, Suzanne, for sharing your perspective with us and for exuding so much flooring passion in your store. Conversation lies at the heart of The Age of Conversation. But, it's not just any conversation. It's a richly textured one, with increased meaning, broader reach, and certainly greater relevance than ever before. Consider, then, the new definitions of conversation that the following authors have developed in their contributions to The Age of Conversation - the amazing book created by 103 bloggers from around the globe. Luc Debaisieux in "The Dawn of Shared Consciousness" considers our time to be the next quantum leap in human evolution. "What if people could have the tools to find, organize and regroup thoughts within a very short time notice, around a common opinion, feeling, mood or emotion? Distance would not matter. Time would relatively matter... Well, this is .. NOW, and it is just the beginning." Jessica Hagy creates poetry with "Sharing." "Ideas kept in the dark don't corner markets./Ideas kept secret don't succeed./.../So share what you've got. What you know./What you think./Let it out where it can grow and spread and thrive./ Otherwise, it might as well not even exist." Ann Handley in "How Many People Are You Talking To?" brings home to us all the power of conversation. "One simple conversation achieved a laundry list of objectives. It established a personal connection between Anne -- and by extension, United -- and me. ... I began to build trust -- with Anne, United and the flying process. The conversation invested me more fully in the brand than a pamphlet or whitepaper ever could have." Robert Hruzek explains that "The Age of Conversation Makes Me Think of ... Bridges." That's right. "In a sense, then, the conversation is the bridge.... Conversation, when employed wisely, can easily become an effective tool for bridging geographical, political, and ideological barriers." Richard Huntington states that "Opinion is the Lifeblood of Conversation." "After all, what makes you want to join a conversation, whether online or face-to-face?... I'll bet it is because you couldn't agree more with what someone says. Or because you couldn't agree less... Or simply that the point of view being put forward is in some way fresh and unfamiliar to you.... So, if you want to get the conversation started and if you want to keep it rich and rewarding, get opinionated." CK describes "The 'Share' Economy." It is "about people using technology to connect with others and share their interests, experiences, expertise and preferences.... [where] contribution has evolved into this era's cost-of-entry.... The more robust the contribution the greater the contributor's value becomes to their communities [and audiences]." Valeria Maltoni states in "ConversationAgent.com: The Conversation Age @ Work" that "conversation is the market where ideas start taking shape and form.... Being extraordinary and authentic are still paramount. This renaissance in the free exchange of ideas and relationships is encouraging and deepening creative thought and innovation, and putting power back in the hearts and minds of individuals." Carolyn Manning draws marvelous parallels in "Communication Isn't Lost" between the Lost Generation and the Blogging Community. Namely, that "The Lost Generation read from each other and talked together; they shared ideas freely. The Bloggers do the same. The Lost Generation found themselves and, by virtue of their camaraderie, showed themselves and let the world find them, as well. The Bloggers are following suit in that process." Drew McLellan in "Full Circle" puts our new conversation environment into perspective. From a hostile, opaque, impersonal environment, we have returned to "the same village." Why? "...Interesting things happened. The Internet. Blogs. Citizen marketers. Rather than hiding behind an advocacy group, the consumers began to realize that their voice could be heard. Suddenly size wasn't as crucial. A small businessperson could compete along side that conglomerate. People started to have conversations. To communicate. To connect." Roberta Rosenberg tells a story in "At My Grandmother's Table" about the "most intimate and powerful form of persuasive conversation in print": letters. She says: "we may blog into the void and wonder who's out there, but we write letters to individuals, to persons we know or want to know - and to have them know us." Nathan Snell asks "Are You Real?" It's a critical question because this Age of Conversation is "now about authenticity, not with "customers," but with what is the community that supports you. It's about conversations that show humanity, transparency and build trust. It's now about showing you." S. Neil Vineberg, in "Community and Conversation," urges "each of us in his or her own way [to] utilize community, technology and conversation for the public good, both online and offline. Let's join together in raising personal and collective consciousness in our businesses and communities of interest." In "The Conversation Age Enabled," C.B. Whittemore contrasts today's world to a pre-Web 2.0 world where we lived in isolation - like Helen Keller. Instead, in the Age of Conversation, "we no longer have to face the world alone... Access to information, once the domain of a select few, has been democratized... It truly represents a conversation enabler for all." There you have it. The Age of Conversation redefines conversation. Isn't is delicious that redefining conversation - despite that it now takes place whenever and wherever appropriate - brings us closer to interactions of years-gone-by between people next door? Do you love Thom Filicia and his approach to design? You have a chance, then, to see him in person at the Arizona Design Center in Scottsdale, Arizona, on October 6, 2007 as he decorates From The Floor Up. This continues the program that Karastan introduced in Chicago and Boston in early May [read Come Decorate From the Floor Up With Thom Filicia in Boston and Time For Decorating From The Floor Up]. 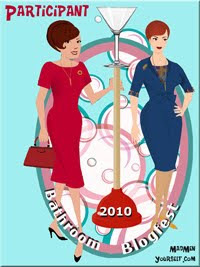 We are sponsors and all proceeds from the ticket sales will be donated to Susan G. Komen for the Cure. Tickets are available at Karastan.com or at Baker Brothers stores. Ticket prices are $20 for general admission or $75 for general admission and a meet-and-greet reception with Filicia. If you can't go, but know someone in the Phoenix vicinity who might be interested, please let them know. I guarantee this will be loads of fun. Chicago and Boston were a blast. "Neurologically, anticipation takes place directly in our pleasure centre, along with only three other emotions: fear, rage and the prey-pursuit urge. It's dangerous to disappoint such a deep-rooted emotion." He directed me to More On Anticipation. Check out the final paragraph: "This does not mean that the fun stops at the gate to Disneyland, but it means that the anticipatory enjoyment we experience before arrival is truly happening at a deeper level to the - presumable more social and cerebral - joys awaiting beyond." In other words, anticipatory enjoyment - or expectation - matters especially in retail environments, where the level of anticipation translates into customer loyalty [and profitability] for the retailer! Hence the need to pay close attention to the messages we send our customers - deliberately and accidentally. These messages affect their expectations, and their expectations of us are what differentiate us from the price-based commodity experience down the road. Right? "I think that her [CB's] high expectations led to a more severe disappointment than she might have felt if she wasn't so enamored with this particular retailer in the first place." If high expectations lead to more severe disappointment, does that mean that consumers should be satisfied with mediocrity? Hmmmm. Now, isn't marketing about raising expectations? About differentiating ourselves from the competition? Don't we expect our points of differentiation to be truly unique and sustainable - so our customers can count on them day in/out, and anticipate their availability? Gerba refers to Jet Blue and its early 2007 NYC fiasco [see JetBlue weather woes not yet overcome] and writes that "the airline had such a tremendously positive reputation that a glitch that would have merely upset another airline's customer base got JetBlue's passengers really, really angry. In short, JetBlue's customers -- just like IKEA's -- felt a more severe disappointment because their expectations were so high to begin with." It's an interesting premise. I consider it flawed. I doubt that anyone stuck for 8 or 9 hours in an airplane - not to mention in the conditions that these passengers were in - would ever consider their plight a "glitch." The reality is if it hadn't been for that reservoir of loyalty and good will, combined with Jet Blue's immediate reactions, the airline wouldn't be in business today. As it is, the airline is still recuperating from the after-effects [see S&P Lightens Up on JetBlue]. Because of its customers' high expectations, JetBlue continues to push itself [see JetBlue Differentiates Its Business Again], further differentiating itself from the competition. Yes, high consumer expectations can be problematic; they require constant attention. Forget complacency. That's the kiss of death. Resting on any laurels? That is so passe'! Not really interested in listening to what your customer has to say? You're in trouble! Not willing to consider what you are doing from your customer's perspective? You will definitely shatter expectations. Nonetheless, high customer expectations separate mediocrity from greatness. They lead to loyalty and a strong likelihood of long term viability. They lead to satisfaction, which sure beats dissatisfaction! In fact, I reread an early post titled I Can't Get No Satisfaction about the First Annual Retail Customer Dissatisfaction Study. Major finding: customers will talk about bad experiences; customers will avoid stores because of bad experiences. So, you absolutely do want to prevent disappointment! Getting back to IKEA, IKEA gets 'it' on many fronts, but fails on others as it did in Shattering Expectations II with its cafeteria. Despite a situation out-of-its control, it had an opportunity to not just meet expectations, but to surpass them. Instead, IKEA sent a message that screamed indifference to its customers. For those who aren't familiar, IKEA draws consumers from considerable distances. Entire families go as a group, and IKEA wants these people to stay as long as possible because the longer they stay, the more likely they are to buy. For that reason, it has created play areas throughout the store, including a 'magic forest' for older kids, as well as a cafeteria [also with a play area] full of Scandinavian treats [also sold in-store]. The cafeteria represents a major draw and convenience. The lack of it matters. Especially, unexpectedly. 8.5x11 inch typed signs taped to barriers in front of a darkened cafeteria on the busiest shopping day of the week don't adequately convey to consumers EXPECTING that service any level of regret. Had IKEA considered the situation from their customer's perspective, it might have reacted with a human touch. Perhaps a smiling employee to communicate to consumers a sense of "I care that I've inconvenienced you" while acknowledging a problem and offering solutions [hey, they sell cookies, so spread some cookie love. CK knows how to do that!]. What a low cost solution with an element of fun. [For a really scary IKEA story, read David Polinchock's Ikea Experience. And, BTW, have you ever noticed how many broken samples and displays IKEA keeps on the floor despite samples being the best way to sell products and promote their durability? Hmmm]. The new rules of the game require that we constantly meet and exceed our customers' expectations. Why? Because consumers run the show. They are in control. They have plenty of options for spending their hard-earned resources. What they don't have is excess time or tolerance for mediocrity. So, I may return to IKEA. But, not regularly. And no longer as a destination with my parents or my daughter. And definitely no longer for fun. My expectations have been shattered. A book like The Age of Conversation, with 103 authors and 103 unique perspectives, absolutely broadens awareness, and inspires us to go beyond the day-to-day. G.Kofi Annan explains in "From Aid to Opportunity" that "with increased communication between individuals, consumers are more educated and critical of companies who develop programs that are uninspired. Today consumers require that businesses become active participants in community conversations both with the consumers themselves and recipients of aid; companies who exhibit a multi-layered Afri-activism program now enjoy a strengthened brand image." Steve Bannister describes the pursuit of happiness in "How To Be Happy." "This pursuit may involve satisfying our most basic need to survive or it may involve satisfying a more philosophical need to understand our existence. Whatever the case, once our basic needs are met, the following question remains: how do we attain this elusive state called happiness?" Cedric Giorgi writes about "The Internationalization of Word of Mouth" and how it will reach a new dimension with web 2.0. "International WOM will, in fact, improve conversations all around the world. As a consequence, almost everything will be known on earth and companies or governments will have to tell the truth and start real conversations with people!" AJ James boldly captures "The Art of Non-Conversation." He asks: "Are the conversations not already taking place?" I say, yes and no. It depends. Check out his contribution and let me know what you think. Amy Jussel brings up ethics and accountability in advertising with "Mommy, Why is that Lady Licking a Beer Bottle?" She cites staggering statistics relating to our children and urges that "we MUST take responsibility for the marketing messages we're putting out there." John La Grou exposes us to "The Emerging Microclesia" - "a global voice in which ideas and imagination, not structural or positional power, moderate religious dialogue.... [It] is bridging superficial sectarian divides; exploring commonality as much as difference; maintaining creative relevancy to diverse global cultures; remaining sensitive to our shared humanity and common need for grace." Colin McKay brings up "Governments" and "getting them to participate in meaningful conversation." I hadn't considered the implications associated with it all... "Governments are already behind the eight ball when it comes to public trust -- their social media efforts need to demonstrate value and a true exchange of information." Chris Newlan writes that "We Are All News Hounds Now." Despite the changes wrought by citizen-journalism, journalism is far from dead. "We are witnessing the emergence of an environment where the traditions of mainstream media are preserved but complemented by more input and diversity." Emily Reed asks "Is your brand a bore?" quoting Emily Post. The question is certainly relevant and the advice, priceless. Brian Reich puts media into perspective in "Putting Media Back in the Middle." More specifically, "media ... is the information, the experiences and the stuff that we create, consume and share every day. Media is at the core of what organizations do and what inspires their work. Media is what we learn from, talk about, and define ourselves by.... Organizations must create good media." Nick Rice elevates the whole notion of a brand in "Authenticity-based Branding." He says "if you continue to ignore or stifle conversation between employees, suppliers and customers, you're not authentically building your brand." He then asks seven questions to ask ourselves in order to "create authentic interactions and conversations" for and with our brands. Cord Silverstein celebrates giving "Voice to the Voiceless." "We are living in a spectacular time where technology has enabled anyone who wants their voice to be heard an opportunity to do so. People who once felt helpless and voiceless are now empowered. Our communications and conversations do not have the borders or boundaries they once had." Craig Wilson describes "Bringing It Back to Local" with Hunter's Best which "is taking the best of the web and bringing it back to a local level, so that regional viewers and businesses can see the forest from the trees." Faris Yakob says "Don't Give Me Songs. Give Me Something to Sing About." Brands may have offered us songs and ditties in the past. Today, though, "people have wrestled back control of brands because each of us has a voice now and we can make ourselves heard - online everyone is equal." Do you feel inspired? Has your awareness increased dramatically? And, if you haven't already, go to LuLu Age of Conversation to purchase your own copy. It will expand your awareness and offer you inspiration.